I’ve spent a lot of time thinking and writing about training the last few months. I’ve been forced to articulate a training philosophy, not that I didn’t have one, but as a full time athlete I often trained without reasoning. As time becomes increasingly precious it’s a luxury I can’t afford, as a philosophy train more only takes you so far. Defining my coaching philosophy for a prospective athlete isn’t a point I want to stumble on. I’ve replaced early vagueness with a definite approach. Train more hasn’t gone, it’s just too simplistic and never sits well when an athlete has 10 hours spare a week. Most of us have a limit on how long we can train and that may come before the body gives up. I’m not abandoning the value of volume, but suggesting that it’s not essential to your goals. If you enjoy it, have the time and your fitness can handle it I’d encourage any athlete to train as much as they can. What’s evident from my last few years of experience and the resulting changes in training is how you train more is an important part of the equation. I’ve been beaten by athletes who train less than me and questioned my approach. Perhaps they had a better taper, a longer training history or maybe it was a better training plan? Looking at hours misses so many factors, if they worked harder in fewer hours then effectively their training load could be the same. I’ve seen that transformation first hand. Reviewing four years of diaries to develop my simple Ironman training plan and more recently for my season review at Endurance Corner let me follow the transformation to the present. Over that time I’ve tried a lot, but only selected so much to carry forward. The chart below breaks down those four years into five stages of training. Beginning at the centre with life as a working Ironman triathlete the most important aspect of this stage is that the proportion of hard training is at it’s highest. I’d more time to recover whilst sat at a desk and less overall training stress in my life (I was also younger!) The bulk of my training is still at steady intensities, but it’s at it’s lowest proportion. This period was the biggest influencer on the simple training plan and a lot of key concepts for my coaching philosophy were born here. The focus was time efficiency and getting training done, weekend sessions were longer, but on weekdays time was limited. Consistency in longer sessions was lacking, I had the potential to train more. After two Ironmans I move into my obsessive stage. There’s a relative increase in the proportion of easy and steady training to harder work, but training hours had risen so it’s likely time spent at harder efforts remained the same. I lacked fitness to increase both overall volume and intensity at this point. I was still working so increased training involved weekends or camps, I learnt the benefits of big training weekends and periods of volume. When the obsession took me full time there was a huge swing in training, volume increased further and with it the proportion of time spent at steady or easy efforts. I’d train for hours and fatigue ensured most of it was steady, it took a lot to make me work. I was slowly adapting to handle the longer hours. Training more works, even if it’s steady training, the problem is if it’s steady you have to do a lot. I was doing enough to see improvements to my Ironman results, but you couldn’t replicate it whilst working. 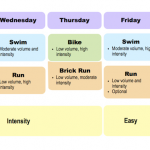 My approach to swimming and running might be used – frequency and a little more volume gave good results with only a small amount of hard work needed. 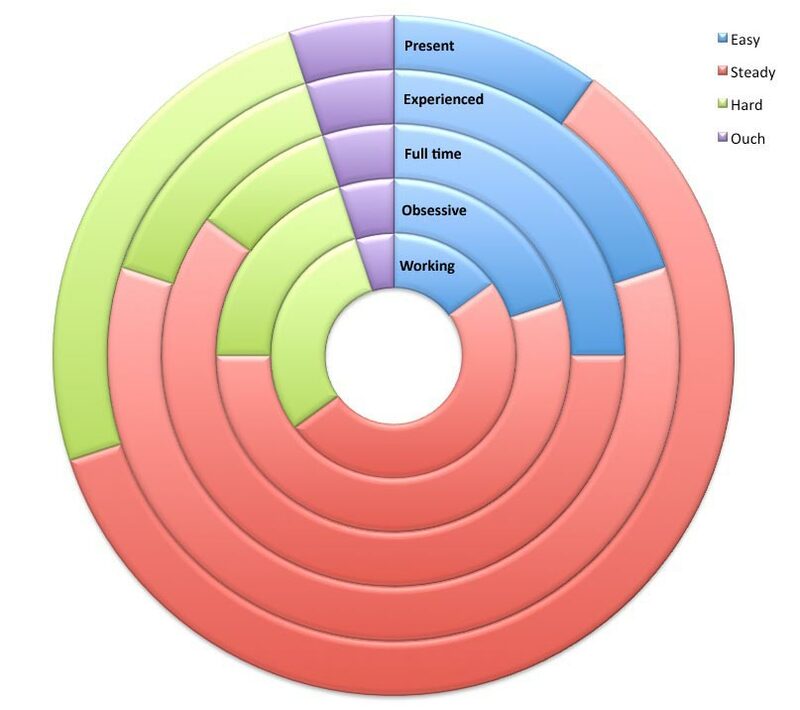 More experienced my second full time year saw a drop in hours, but an increase in the proportion of hard work. Less training by time, but more by workload I was applying a greater training load in a more efficient manner. Race results gave an indication that the approach was working, I realised more volume had initially increased load, but I’d taken it as far as I could. My present training hours have settled lower than the full time years, but the proportion of hard training has increased. I’ve adopted the time efficiency of my working days and the need for volume. Weeks involve shorter, hard sessions and longer steady work as the season progresses I mix the two, but always keep easy sessions to a minimum. Kona may have been an early indicator of things to come, I felt far stronger on the bike than previous races. I still believe in training more, but not in doing so blindly. It isn’t more hours it’s training load and you can increase that through intensity or duration. An effective program needs both, ratios of intensity are determined by fitness and available time. Each sport applies different stresses to the body and this has to be accounted for too. More training is good so long as you can recover, work hard and work specifically. I don’t doubt in another year I’ll be adding a new stage to my evolving training philosophy. There are fundamentals that remain true throughout, but constant refinements to be made. Patience and a willingness to work are perhaps the most important parts of my philosophy.